Can we really only have foresight in hindsight? Go to the cliff?? Where’s the frigging cliff?? Can we really only have foresight in hindsight? Or are we smarter than that? It’s funny how things tie together. I wrote just last week about how, if we can see that something bad is going to happen, it is our duty to act to prevent it. And now, this week, the seven Italian geoscientists, engineers and government officials who are charged with failing to give the public adequate warning of a probable earthquake are big international news. (I actually wrote about this case back in June, for the Guardian). So, over in Italy those officials are being charged with manslaughter – after the earthquake. (The earthquake that occurred there, just six days after the group had released a statement that there was no increased danger of a major quake, killed 309 people). Over here, we know with 100% certainty that a major quake is coming. We cannot predict exactly when – it could come this afternoon, or not for another 200 years – but there is 100% certainty that it will come. And the destruction of buildings and infrastructure and the loss of human life will be on the scale of what we all witnessed in Japan this past March. It is most likely that thousands, possibly even tens of thousands, will die. We cannot prevent that quake. But we can prevent many of the deaths if we educate ourselves, and prepare for it now. And this is one of the main reasons that I have moved away from Tofino. Port Alberni is not that far away – the earthquake and tsunami will be almost as bad there as they will be here. But how these two communities are preparing for these coming events is completely different. There was insufficient understanding of the nature of a magnitude 9 earthquake (which means that numerous trees will be down across the roads and driving will not be an option for evacuation). Safe zones must be close enough to reach on foot, within 15 minutes of the earthquake. The plan assumed people would be driving. There was insufficient understanding of the events to understand what kind of emergency kits people must have: Two types are required: the so-called “Grab’n’go” kit, which you run with to escape the coming tsunam; and then a long-term survival kit to withstand the weeks or months where access to food, water, and other basic supplies will be limited. Their official Grab’n’go kit list contained 126 items! (which included items such as a cribbage board, fire extinguisher, and shower cap) – virtually guaranteeing that anyone who obeyed the official planners’ recommendations would not be able to drag that kit up the hill before the first tsunami wave hit. I continued to research the subject, and to offer information to Tofino’s emergency planners and to Tofino Council. I published blog articles, I talked on CBC Radio, I was even interviewed on CBC TV’s The National. To this day, four years later, no Tofino official has ever responded specifically to my input (even just to tell me to shut up!). I tried increasingly provocative blog post titles (from You’re all gonna die: Whatever in June 2010) to an angry but informative rant published last March. By the time of that last one, I had given up on Tofino… I was already half-moved to Port Alberni – but I left it as a bit of a legacy, with all of the links to every article and interview I had done on the subject, in case someone in Tofino ever decides they do want to use my research. And where has Tofino got with this? Well, in June of 2010 the mayor, John Fraser, finally mustered himself up to get on CBC Radio to address this subject. Apparently his understanding of the event is so minimal that he does not actually understand that the earthquake will affect the entire west coast region, not just Tofino – so Vancouver will not be dispatching a ship to Tofino within 24 hours, as he is counting on. Vancouver will be digging itself out. And he believes that Tofitians will survive by eating farmed fish. (Umm, if anyone saw the Japan videos, you might remember that there is a bit of current associated with those tsunami waves. I don’t think those Atlantic salmon will be sticking around). You can listen to that CBC interview with the mayor here. And then, this past March, the mayor stuck his foot in it again on GlobalTV – saying that locals “should” know where to go to under a tsunami warning (well, if they follow the official Tofino recommendations, sadly, that would be into the inundation zone) – but that visitors will be running around like crazy. (Umm, shouldn’t Tofino take some responsibility in making sure that visitors know what to do too? Not to mention that he is not making a tourism-dependent town look very inviting to tourists!) Unfortunately, GlobalTV seems to have taken down that video clip but you can read some of the locals’ reaction to it here. So, back to the Italian case. Scientists and government officials are being charged, the earthquake, for allegedly not providing adequate information and warning. 309 people died. I want to know about here. I want to know about now, before the earthquake, before people have died. Here in Tofino, government officials are not providing adequate warning or information or planning for an event that we know is coming, and that we know will be deadly. Must we wait until after the event happens, and hundreds or thousands of people die needlessly, due to inadequate or, in the case of Tofino, also dangerously inappropriate information? Or can we actually act with foresight, rather than hindsight? Must we wait until people die? Or can we charge them now? Reference: Map showing official Tofino tsunami evacuation routes. Brown area is the tsunami inundation zone. White areas are safe areas. Look how much of the inundation zone people are expected to travel through, and how many safe areas they bypass, if they follow this plan. Remember, trees will be down and driving will be impossible. They have 15 minutes to get to safety. I am supposed to be visiting Todino this coming Friday. Staying at the Wickanninish inn…. 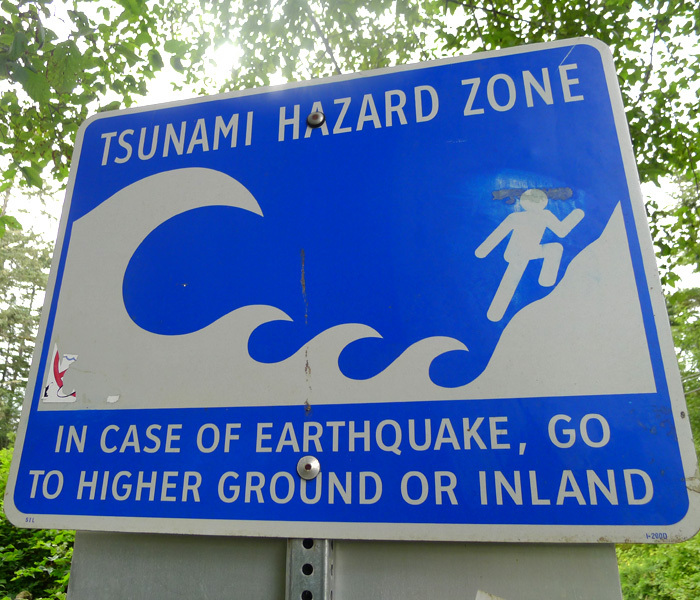 I cannot find information as to where I should go in case of tsunami? Could you advise where I may find that info? I believe that the Wickaninnish Inn has a place (a hill) right on their property that is high enough to be above the tsunami level. Phone the front desk and ask them. If the person you talk to doesn’t know, ask again when you check in, and insist that you talk to someone who can answer that question for you. If they really do not have a place on the grounds that they can tell you to go to, if I were at the Wick and there was a big earthquake, I would run back up to the highway, head north (towards Tofino) and, a few 100 m up the road, would turn into the little shopping complex (where Beaches Grocery and the surf shop are) and run up the hill behind there. Wait it out for at leats 12 hours. Even if you are cold and have no food… you can survive 12 hours up there, and you should wait it out until all the tsunami waves have definitely passed. But the tsunami could come as little as 15 minutes after the earthquake and, depending upon what kind of runner you are, that run could take anything from 10 to 30 minutes. So if there is a place right there on the Wick’s property, that would be your best option. So ask them. And…it is really good that you are asking this question. But don’t get too stressed out – the chances of it happening while you are there are incredibly small (a tiny fraction of 1%). It is still good that you are thinking about it, on the very tiny chance that it happens… it is good to know what to do. But don’t let your worries ruin your vacation! Thank you SO much for your quick reply! I truly appreciate you taking the time to help me understand where a safe place would be in case of tsunami. What if you are staying at Cox Bay…Pacific Sands. Where would you go? Rosie Bay? Sorry for a fairly quick reply – I can’t keep putting time into researching each location and each resort to write personal replies for every scenario. This is info that the town of Tofino and the resorts should be providing. Their lack of action – despite all of my (volunteer, i.e. FREE) efforts to get them on this – are one of the main reasons I moved away from Tofino five years ago. I am disappointed that there is still not public info available that is specific to each location (i.e. resort, hotel, etc.). That said… Cox Bay is not an ideal place to be. If it is a tsunami warning (earthquake elsewhere, tsunami expected here) I would drive into town. If there is a big earthquake here, and roads are undriveable, I would probably run up to the northwest end of the beach – there is a trail that takes you up the rocks there. The clear area up on the rocks is NOT high enough. I don’t really know the trails there, but I am pretty sure there would be some trails that head inland and uphill through the forest (if you don’t find a trail you will have to bushbash – if you are worried about this, I would suggest you go for a little exploratory walk there to scout it out your first day there – it is very pretty up there, especially this time of year with the wildflowers blooming). If you get up to where the houses are, you are around 26 m above sea level, which PROBABLY is fine (although scientists are not 100% sure just how high it could be – probably 15 m is fine, but I would go higher if there is a possibility of that). – but close enough that you are sure to get there in time. Sorry I cannot keep answering all of these questions personally. I get so many questions on the blog as well as personal emails, and the town and the resort you are staying at should be providing you with this information. So go bug them and make them do it!